Royal Air Force (RAF) construction specialists have been hard at work in Romania to support the UK MoD’s latest aircraft deployment. Eight airmen from 5001 Squadron, RAF Wittering, have been building temporary sunshades at Mihail Kogalniceanu (MK) airbase near Constanta on the Black Sea coast. The Rubb military shelters help protect Typhoon fighter jets from the elements. Although the crew was highly experienced, the task was challenging due to rain and high winds. Sergeant Sam Burt (32), the team leader said: "The Squadron is hugely experienced with this type of work having worked all over the world, including the Middle East, Cyprus and the Falklands." The team of eight included seven mechanics and an electrician. They arrived at MK in April to build the temporary hangars known in the RAF as sunshades. Sergeant Burt added: "The weather conditions in the Black Sea area have made this build particularly challenging, not least the very high winds that can come in off the sea. Trying to drag large sections of material in such conditions is too dangerous so we’ve had to wait until the right moment." The two sunshades, each eight metres wide, are needed to keep the Typhoons and their cockpits from overheating during the summer, while they and their pilots sit on ‘Q’ (Quick Reaction Alert). Throughout the RAF’s deployment to Romania, the jets will be ready to patrol Romanian airspace against any threat. 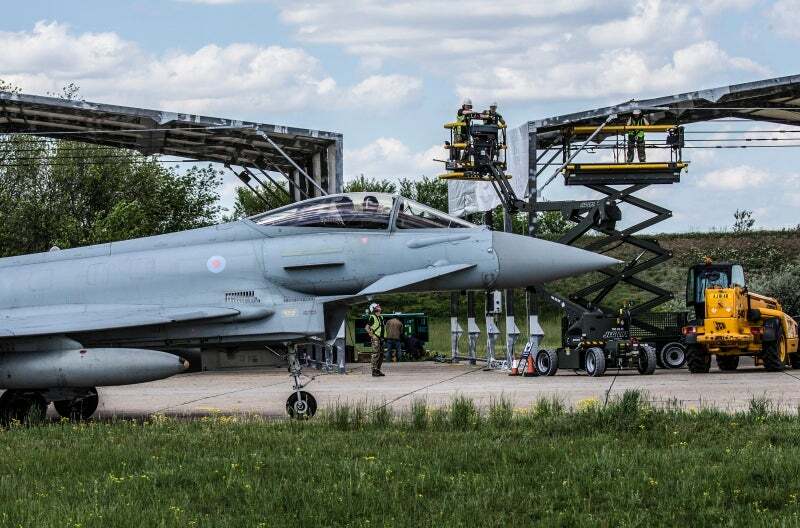 The RAF presence in Romania comprises jets from three (Fighter) Squadron based at RAF Coningsby, supported by around 150 personnel drawn from stations across the UK, who make up 135 Expeditionary Air Wing. The RAF mission is to conduct NATO Enhanced Air Policing (eAP) as part of NATO’s Assurance Measures. These measures were introduced in 2014 to demonstrate the collective resolve of the Allies, the defensive nature of NATO.